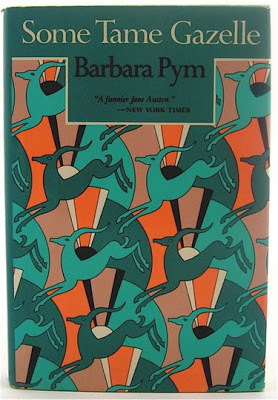 I read Barbara Pym on the way to Omaha. It’s not a very long trip. Bounce into the car at 9 a.m., open your copy of Pym’s first novel, Some Tame Gazelle, and a few hours later you look up and find yourself in the city. You probably know nothing about Omaha. It is actually a very nice city, as we discovered when we moved to this area. Right now there is a wonderful exhibition at the Joslyn Art Museum, “Ten Masterworks from the Whitney Museum,” and if you don’t live in New York, as we don’t, it is a great opportunity to see modernist paintings by Robert Henri, Georgia O’Keefe, John Sloan, Thomas Hart Benton, Max Weber, Reginald Marsh, Gerald Murphy, William J. Glackens, John Steuart Curry, and Maurice Prendergast. 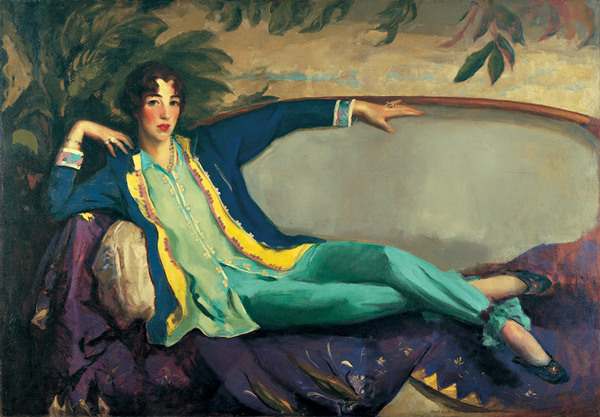 I especially admired Robert Henri’s portrait of Gertrude Vanderbilt Whitney, the founder of the Whitney Museum of American art. Her husband thought her pants so outrageous that he refused to hang the painting in their mansion. 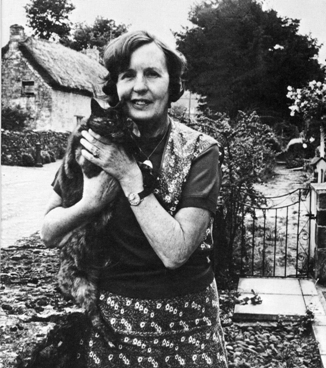 You may wonder what Gertrude’s unsuitable pants have to do with the novelist Barbara Pym. She was nothing like Gertrude Vanderbilt Whitney, as you can see from the photo of Pym below. While Gertrude, a wealthy sculptor and lover of modern art, lounged in a beautiful blue silk embroidered jacket and teal pajama pants, Barbara wears a down-to-earth print vest and skirt that no cat’s claws will pill. But Pym is obsessed with fashion in her books. In life she was also besotted by fashion, according to many entries in A Very Private Eye: An Autobiography in Diaries and Letters by Barbara Pym and edited by Hazel Holt and Hilary Pym. In her witty, beautifully-crafted first novel, Some Tame Gazelle, the fiftysomething heroine, Belinda Bede, muses endlessly about clothes. Belinda wears “suitable” dresses and sensible shoes, while her younger sister Harriet reads Vogue and insists that Miss Prior, the village seamstress, make her fashionable dresses with the latest sleeves. The Bede sisters live next door to the vicarage, and since their lives revolve around the church, they are always planning what to wear to church functions: garden parties, concerts, and lectures. But all is not perfect in this seemingly rather asexual world. Belinda is in love with the Archdeacon, her old boyfriend at Oxford, whom she lost to a snobbish medievalist, Agatha, now his suitable wife; Harriet is obsessed with whoever the curate is of the moment, and entertains the very young Mr. Donne with meals of boiled chicken and pudding. Even Harriet’s quasi-romance is imperiled: there is a possibility that Mr. Donne is in love with an older woman, a medievalist at Oxford. Belinda has frequent clashes with Agatha. When Belinda hangs green festoons around a stall for the vicarage garden party, Agatha takes them down and redoes them. Agatha is threatened by her rival Belinda’s seemingly endless ability to listen to the Archdeacon quote poetry. But back to clothes: before the vicarage garden party, Belinda is sewing. She knows she will wear a crepe de Chine dress and coatee with sensible shoes that are a little too heavy for the dress. But what will the others wear? Harriet, who wears high heels to the garden party, though Belinda wondered if they were comfortable, buys Vogue patterns a size or two too small so she can just squeeze into her tight-fitting clothes. Sensible Belinda believes that she and Harriet should be beyond fashion at their age, but Harriet debates whether she should wear her white fur cape or a gold lame jacket to a church concert. In the end she goes with the cape. Unlike Belinda, Harriet has suitors: an Italian count who lives in the village courts her. Sewing and knitting are constant activities. The women are always letting out seams, knitting pullovers, and darning sock. When Miss Prior, the seamstress, comes to the Bedes to sew clothes, chair covers, and bathroom curtains, you would expect her to be stylish, but “her dress was drab and dateless.” Important though she is in village life, her status is surprisingly low. Belinda wants to give her a good lunch, but Harriet insists on feeding Miss Prior cauliflower cheese and saving the meat for dinner for the curate, Mr. Dunne. When the caterpillar cheese has a caterpillar in it, Belinda is even more embarrassed, and suggests that Miss Prior must get better meals at the Archdeacon’s. But Miss Prior, giggling, confides that the food is terrible there. This brilliant first novel, published in 1950, is utterly charming. I very much enjoyed Pym’s descriptions of what people wear as well as who they all are, and, yes, this novel actually is Austen-ish, unlike many of the novels described so. This entry was tagged Barbara Pym, Some Tame Gazelle. Bookmark the permalink. Henri was new to me. I would love to see this exhibition again: if I lived there, I would nip over to see it two or three times before it leaves. It simply amazes me how much one art museum can do for the public. Big art museums in the Midwest are far and few between. The Chicago Art Institute is wonderful, but one can’t be flying to Chicago all the time. If I hadn’t looked at Pym’s photo before seeing the painting of Whitney, I might not have paid attention to the “fashion” details. I really must get back to Ms. Pym. 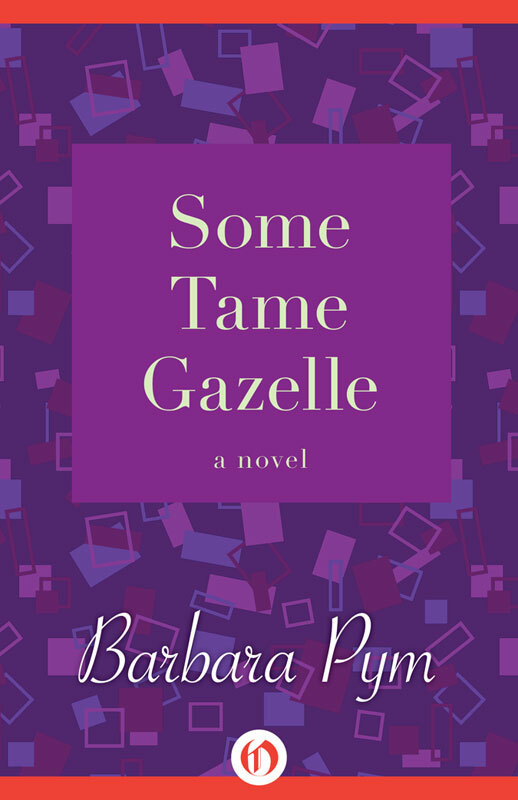 I don’t think I have read “Some Tame Gazelle” and you make it sound so wonderful. I love the painting of Gertrude Whitney. What colors! It would be tres chic to lounge about the house in a pair of teal pajama pants. She manages to look so elegant. Robert Henri is the author of “The Art Spirit” which my friend who paints lovely watercolors recommends highly to aspiring artists. I have it but have not read any of it yet. I guess I am not aspiring enough! Heavens, The Art Spirit sounds wonderful! I don’t paint myself, but it might be fun to read anyway. My lounging outfits are more like Pym’s, alas!